The Wychitella District Landcare Group has begun a trial of a new biological control agent as part of a new push for integrated weed control of Wheel Cactus (Opuntia robusta) in the Wychitella area. Released on Mt Buckrabanyule in late January, the biological control agent is a cochineal scale insect that has had success in inhibiting growth of the Wheel Cactus in South Australia. The cochineal insects were sourced from the Tarrengower Cactus Control Committee at Maldon, who have three release sites for the bug. The bug is just one of several methods used by the “Cactus Warriors” from Maldon, including the highly effective stem injection with glyphosate and physical removal of small cacti. The Wychitella District Landcare Group is working with the Loddon Plains Landcare Network and the North Central Catchment Management Authority to develop strategies for tackling this weed. 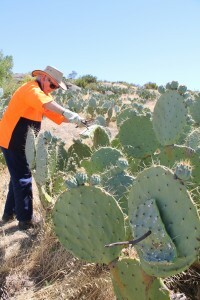 “While the viability of the cochineal insect as a biological control for Wheel Cactus in this part of the country is unknown, it is clear that an integrated approach to tackle infestations of cacti is required, as is the case with many weed species” said Anthony Gallacher, Landcare Facilitator, Loddon Plains Landcare Network. The group will monitor the progress and spread of the insect and if successful, will look at release outside of the current trial site. If you are interested in hearing more or would like to get involved in fighting Wheel Cactus, please contact Anthony Gallacher. Photo: Janet Richardson, Wychitella District Landcare Group, releases the cochineal scale insect at Mt Buckrabanyule, with infested pads pinned to healthy Wheel Cactus plants.